Each participant that signs your digital waiver online, away from your location, can be required to verify their email address when submitting the waiver. This adds an extra layer of verification to the waiver signing process. 1. 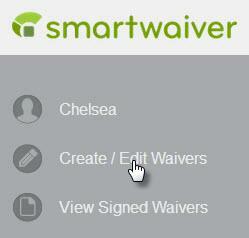 Click on Create / Edit Waivers and select your waiver to edit. 2. Click on the Options tab and then Emails. 3. Click on the checkmark to remove the feature and click Yes to confirm your action. 4. Click on the Publish tab to save your changes. 5. Click on the Publish Your Waiver button to publish your changes. Participants will no longer receive an email asking to verify their email address after completing your digital waiver online.